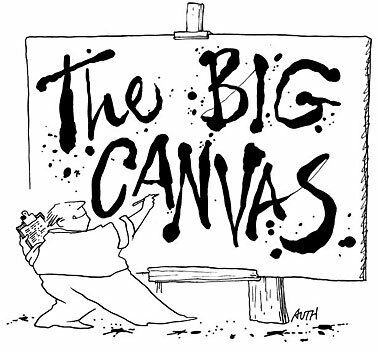 The big canvas of life, it's hoped that each artist does find their own path to creative expression. Now whether that canvas is a well-made bottle of wine, or the roll of a fine cigar, or a perfectly aged single malt Scotch, ultimately we each put our stamp of finesse on the finished work. Each artist has their own canvas and, the artist can be as varied as the canvas itself. Whether you be a tinker, tailor or poet or what have you, it does not matter. Because each artisan who aspires to do a 'work' and does it well, is an artist whose canvas awaits them. Now those three I've just mentioned, also just happen to be three of my recently [relatively speaking] acquired favorite subjects to explore. 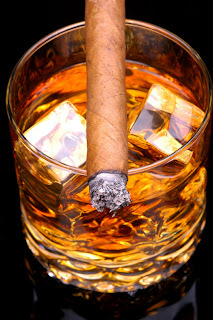 Wine as recent as seven years ago, cigars a couple years ago and Scotch can be described as my newest fields of interest. Here's your Sign: So what are the hallmarks of quality art? I mean how do we know when we are looking at an exquisite [relatively speaking] artists work? Further, how do we know as simple garden variety fine art appreciators, that a potential masterpiece is being hewn from a slab of marble? Hmm, good questions; I think the answer is simple, [duh] when there's a clamor for what is being produced. I like to believe; when you have a following and folks will get in line to see it, smoke it, or taste it and most importantly depart with some of the those hard earned dollars. This I believe is the tell-tale sign that something extraordinary is going on and, worth a closer look. Conversely, it's not "great" or even good art then I say let the market decide its fate. But, if you need to have a government subsidy to prop-up or support those efforts just so you can stay in business; then you may want to another vocation [which why I'm no artist]. Government subsidized art removes a notion many subscribe to, known as natural selection or the survival of the fittest or what some call the free-marketplace of ideas. In the Napa Valley where Cabernet Sauvignon, everybody knows Cabernet Sauvignon is King, some would argue in the same vein that Cubans are the kings of the Cigar world [I believe they are]. However I know, many will run to counter these claims with a wild-eyed fervor that these assertions are a product of an untrained palate, [willful misconceptions] but to their own futility. If you disagree with those points, then I'd say, "you're just spitting in the wind" because without the correct historical or value perspective, you're unable to see why those statements have been accurate and continue to ring true today. It can be said and should be known, hell just a flat out accepted axiom. Good to be the King: "It's good to be king, if just for a while...to be there in velvet, yeah, to give 'em a smile ... you're out there with winners, yeah, it's good to be king" thanks to Tom Petty for that lead into this topic, because Cabernet Sauvignon [the king] is better than any other wine on the planet, there I said it, it's on the record. Safe Bet: Mr. Chuck Wagner of Caymus had this to say about Cabernet Sauvignon, "It's safe, [perhaps controversial] to say that the best of Napa Valley produces wines offering power an a richness not regularly achieved by their counterparts from France" [some will shake head, roll eyes California palate]. I agreed with him, if you want to drink Bordeaux do so and if you want a rich and concentrated Napa Cabernet, then drink Napa, but please quit the incessant whining if the two are different, why the hell would anyone want or desire a sea of sameness anyway? Napa Valley Cabernet Sauvignon: In thinking about powerful examples of artists whose canvas is something other than a carefully woven fabric, I believe like many that it can also be expressed in a beautiful bottle of vino. Sorry, the bulk wine producer sitting on grocery store aisles don't qualify for this narrative. They are commodity wine and nothing else; the everyday drinker if you will. Take the comments from Mr. Chuck Wagner who offered up this comment on Napa Cabernet Sauvignon, "We continue to look at Bordeaux [for inspiration], but we don't try to emulate what they do there, we try to make wine in our own style." He went on to say about the topic at hand, "A good cigar is like a great wine, once you finish a glass, it calls you back for another." That my friends are the experience you are looking for in a great bottle of wine, I say lean into it. His statement reveals the point so many wine enthusiasts miss or flat out run by when discussing OW vs. NW vino styles and differences. I don't [actually I have got an idea] why is there so much clamor for NW [new world] wines like those of Caymus and others to modify what they do in an attempt to emulate the French or in a futile attempt to appease a loud minority. It's my opinion that this vociferous minority does so [motivation] only to draw attention to themselves, a shameless attempt at self-promotion. To say to the world, "oh boy [look at me] I'm the smartest kid around the wine-cooler, on the other hand, agree much more with the philosophy of Chuck Wagner "inspiration" yes, but emulation no! Speaking of Caymus, I was recently at a tasting with my friends the San Diego Wine Mafia. Wine Harlots [a fantastic local blogger] had a couple samples for us all to sniff, swirl and slurp our way through that evening, down at the Wet Stone Wine Bar [the subject of an upcoming review]. After some intense slurping, I jotted down a few notes [at times few, but my memory is long] about these wonderful wines. They were both young, but one was drinking very nicely now and the other was a little tight and suggested to me the need for more time in the bottle. Cuban Cigars: Admittedly, I know zero to nothing about cigars other than I really like them especially after a night of tasting twenty or so wines. That said there does some to be a consensus among most cigar enthusiasts that Cubans are the best, made my artisans whose craft literally goes up in smoke, but of course this is a contentious debate among the folks who consider themselves aficionados on the subject. In a 1998, interview with Wine Spectator, Chuck had this to say about Cubans, "One inch of a bad one--and you've got to put it down." That's why he prefers Cuban cigars. "I don't know if other cigar regions will find the magic of Cuba," he sighs, wistfully. I must admit I feel the same way and always lean toward smoking a Cuban whenever the opportunity presents itself. Check out the video at the bottom of this review on how to get started puffing like a pro. Just a couple obvious errors in the video, one being they ash too much and the other is that the flame is not supposed to touch the cigar, only the﻿ heat coming﻿ out of it, according to Beau's Barrel Room. Consider: Do you ever find yourself pondering about the person who rolled the cigar you been puffing on and how it's his or hers' lot in life to paint [figuratively] on the canvas of the Tobacco leaf the wonderful aromas and flavors, think about where these artist live, how much they love their art form which we quietly and sometime reflectively draw in and blow out. These folks are due a bit of respect and appreciation, and should be looked and admired like any other artists, like any other painter, sculptor or composer. On the Record: Perhaps you are wondering why, cigars are entering the fray of discussion on this blog, a "wine" blog no less, well the answer is twofold. Like most folks, I usually have more than one answer to the same question and will often say when asked, ummm "it depends". Safe answer most times, but no playing it safe here, cigars should have valid place of discussion on any wine blog, because like wine they have certain pairing partners that make them better than either could independently. Oh the Scotch: Here's again something I frankly admit I don't have any grasp of the subject. I know I like it with a great cigar and to sit back and enjoy the hand crafted artistry of both together is rather divine. So if in doubt, I would say from what I've experienced so far that Scotch is a great place to start your own whiskey journey. It has been called "the burnt essence of mud" by Brain Wines of whom I will refer you to his article [and expertise] on the subject of great cigars and scotch. Check it out here; Simplifying the Complexities of Sophistication. a mini tutorial on cultivating a taste for the finer things in life. 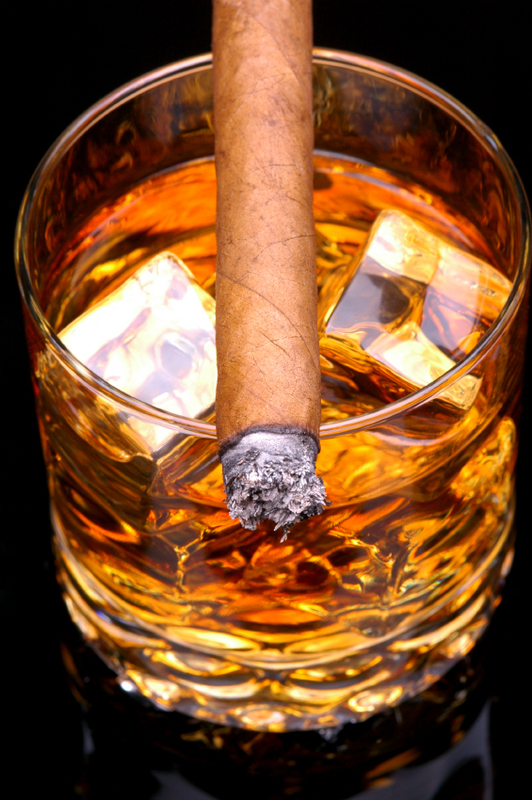 Cognac and Cigars: Still my favorite pairing the ultimate capstone to a perfect meal, ahh yes I do like scotch and cigars just fine, but if push came to shove, I would have to give the edge to Cognac. According to some sources, "Cigars and Cognac are as old a combination as Napoleon and Josephine" and a recommendation to achieve your own outstanding results, find yourself something like a God of Fire 2005 Carlito Churchill, to pair with the XO (Extra Old) cognacs which boast a minimum age of six and a half years in barrel and as a bonus, they often have much older vintages incorporated in the blends. Which ever canvas you decide to take advantage in this life make sure you do it right, do some research and even more exploration. Life is short, so take those opportunities to enjoy the finest life has to offer. Don't settle for cheap imitations, save some coin and step up to great experiences that you will never forget. Like some interesting guy once said, "Until next time stay thirsty, my friends" cheers. Thanks so much for the mentions Bill! We will have to keep up our mutual exploration of both Islay malts and fine puros at our next SDWM meeting! Always a pleasure to share with you, my friend. Hey, no prob I will always defer to an expert on a subject when in doubt..and thanks for the edumacation on the finer points of scotch and cigar smoking, cheers to you! Wine. Scotch. Cigars. Three of my favorite things. Great blog post Bill! Thanks, so glad you stopped by to check it out. Love me a good gar now and then along with a dram of fine SM Scotch.